Ice Magic, a festival deserving of its name. Hosted by The Fairmont Chateau Lake Louise, this 34-hour competition is the most anticipated spectacle of the Festival. 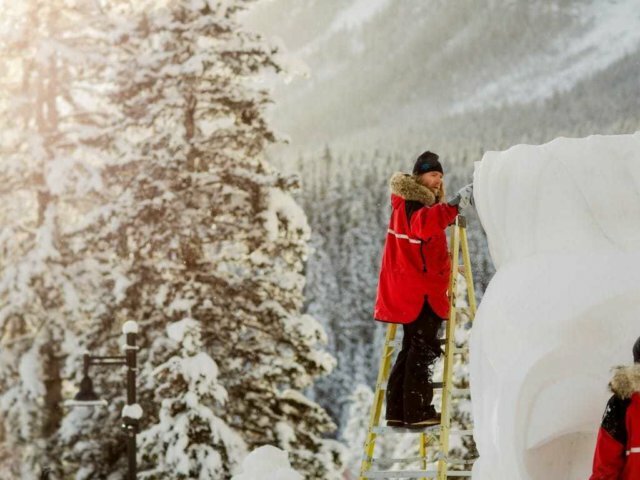 The competition sees twenty four internationally recognized professional ice carvers work in teams of two to sculpt a towering one-of-a-kind works of art from imposing blocks of solid ice on the shores of Lake Louise. With each ice block weighing a daunting 300 lbs, this exceptional art form involves grueling physical labour in a delicate balancing act with precision artistry. The competition takes place at the beginning of this two-week long festival (January 16-27, 2019), but you can see the completed works, well until they melt! When you book at the Mountaineer Lodge, you get free tickets for all-day access to Ice Magic Festival, VIP shuttle access from Samson Mall, steps from the Mountaineer, to Chateau Lake Louise and return. Visit the finished sculptures mid-week when it is a little quieter, when parking is more available, when admission is free, and the ice carvers will have a bit more time for your questions. After visiting the carvings and strolling around, stop in at the Lakeview Lounge at the Chateau Lake Louise for a warm-up appetizer and hot toddy. Bring your skates, or rent them from Wilson Mountain Sports, so you can skate around the iconic ice castle build near the shoreline of Lake Louise.